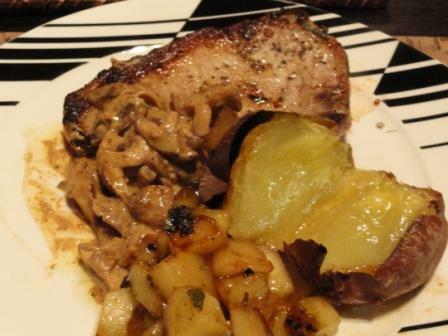 Pork chops and apples has to be one of the most common pairings. Not wanting to make a traditional apple sauce, I chose to chop up some Granny Smith Apples and pan fry them off with some balsamic reduction. A marriage made in heaven. Pork is relatively cheap and an easy meat to find world wide. I’m finding uses for my bottle of vermouth, wonder if I can use that instead of the verlaque?